Chicago, IL – January 31, 2017 – With an extremely busy year on tap, PetCure Oncology kicked off 2017 in style with the opening of its fifth site last week, PetCure Oncology at PVSEC in Pittsburgh, Pennsylvania. The national cancer care provider continues to redefine cancer care for pets by integrating stereotactic radiosurgery (SRS) into veterinary medicine. Now with five locations across the country, PetCure Oncology has made SRS accessible to pet owners in the southwest, midwest and east coast – with the west coast and south soon to come. Since the company launched in mid-2015, PetCure Oncology has quickly emerged as the leading provider of SRS for pets in terms of both patients treated and number of treatment centers. There are only 17 locations in the country capable of delivering SRS to pets, five of which are owned and operated by PetCure Oncology. PetCure Oncology has now treated more than 600 pets with cancer, two-thirds of which have benefitted from SRS. That means that over 400 pet families elected to pursue the advanced form of radiation therapy, which has only recently become available to pets despite being a proven standard of care in human oncology. As PetCure continues to collect data related to outcomes and side effects, early results from pets treated with SRS are consistent with those found in human-focused studies. SRS is still relatively new to veterinary medicine, but has quickly become an ideal cancer treatment because it delivers radiation noninvasively with unprecedented precision. Benefits include fewer treatments, shorter treatment times, and minimal side effects. Clinical Trials: The company’s first clinical trial is currently accepting candidates. The trial represents the first large-scale industry study into the safety and clinical efficacy of SRS in the treatment of canine lung tumors. Clinical Leadership: PetCure Oncology’s Scientific Advisory Board (SAB) is already responsible for creating the first set of delivery protocols and safety standards for veterinary SRS. As more patients receive treatment, the SAB will continue to refine those protocols and begin the process of publishing clinical outcomes research. Accessibility: With current sites in Cincinnati (OH), Clifton (NJ), Milwaukee (WI), Phoenix (AZ) and Pittsburgh (PA), PetCure will continue to grow. Expect 3-5 sites to join the national network in 2017, making SRS accessible to pet owners from coast to coast. 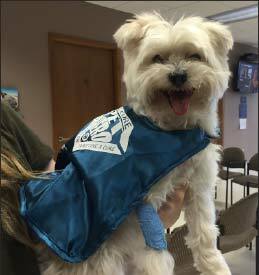 Awareness: PetCure Oncology will promote awareness and education through continuing education programs for veterinary professionals and direct-to-consumer awareness campaigns to pet owners.